Casio BE300 has appeared in Moscow in December, but without russification, that essentially has limited possibilities of this device. The matter is that in this handheld computer is used its own software version created on the basis of Windows CE 3.0, but is not being it in the complete sense of this word. The developers of ВЕ300 have refused some system libraries that has made the software written for Pocket PC 2000 and 2002 (operating systems based on initial WinCE 3.0 code), incompatible with new PDA, for which as a result separate programs (at least, have been redesigned the available ones) have been created. There are a few of them, as, for example, programs for Pocket PC (because of smaller ВЕ300's prevalence), nevertheless to equip this PDA is quite really. Running ahead, I'll note that its popularity grows and new software appears with enviable persistence. Developers of this PDA posed before themselves a problem to reduce device's cost as much as possible, having made it accessible as more as possible, but having saved thus the most used functions. In result has turned out the device without speaker and microphone, but supplied with stereo output for listening music, to which headphones are connected. In reasonable limits the memory size has been cut. It is impossible to name justified, absence of IR-port in the given model: this function became widespread and almost does not influence on final cost of the device. Refusal from licensing of Pocket PC has saved money for license deductions, but has deprived users of many applications which became standard on other handheld computers, in particular Pocket Word, Excel. 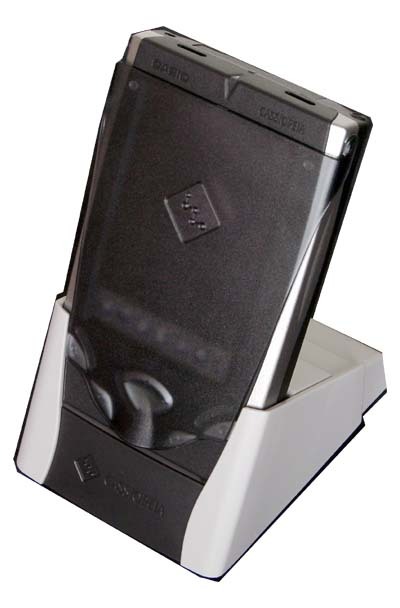 Therefore marketing experts of the company have related the device not to Pocket PC class, but have named it Pocket Manager, tending to designate difference of this handheld computer from others even in the name. Let's take up ВЕ300 in more detail. The handheld computer is completed with cradle, software disc and charger. Fulfilled from light plastic, the cradle has USB-plug and a special stub, moving which, you increase place for handheld computer that is required when installing device with other accessories. The program for data synchronization, PC Connect, can synchronize the data from programs preinstalled on the handheld computer - it's quite enough. At primary installation of the data synchronization program I recommend to disable, whenever is possible, all USB-devices, ВЕ300 is too choosy! The program can no define connected handheld computer - then it should be deleted and reinstalled. Made of plastic, handheld computer weighs only 167 grammes without protective cover (with it a bit more). The matte dark plastic lid covers not only the screen, but also keys, protecting them from stray keystrokes in pocket. Even at maximum brightness of backlight the information on the screen under the cover is not visible - in any case it should be thrown back. Sizes of the device - 121х76х18 mm. In centre of the front panel there is a 4-position navigation key, below from it 4 more keys are semicircle located, one of them is responsible for switching on of the handheld computer, the second - ОК, the third - ESC and, at last, the last - Return to the main menu (the list of applications). Small keys are sunk in the case, therefore to work with them is inconveniently, as, however, and with the navigation key. The screen in ВЕ300 is color, touch-sensitive, is made on STN technology, supports displaying of 32.768 colors, thus has resolution of 320х240 points. Brightness of the backlight is regulated, though a little bit worse, than in a handheld computer on basis of PPC 2002. Reading from the screen in the street is difficult enough, though nevertheless it is appreciably easier, than from the same Cassiopeia E-125. At maximum brightness of the backlight colors start to float, I think, the default is optimal. Under the screen there is a row from 7 sensor icons, which open access to preinstalled programs. The heart of this handheld computer - NEC VR4131 processor with clock rate of 166 MHz (MIPS). Despite of speed in 280 MIPS, it not always copes with resource-capacious applications - there are small delays in operation. However during execution of the majority of standard tasks the handheld computer shows itself from the best side and problems with speed don't arise. In ВЕ300 are installed only 32 MB of memory, at that 16 of them are the flash-memory and 16 - RAM. About 5 megabytes of the flash-memory are occupied under the operating system, the rest of it can be used under programs and data. As you can see, the memory size cannot be named big, possibility of Compact Flash (type II) memory cards connection in part saves the situation, the plug for which is located at the top of the device. It is necessary to tell, that reboot key is located on the left wall side of the handheld computer and, except for it, there is nothing. In the lower end face there is an interface plug (covered with a stub which can be removed and loosed at once), near it there is the plug for connection of charger, on the right there is the plug for headphones. To recharge handheld computer it is possible directly, passing the cradle that can be useful in travels. Stylus in ВЕ300 is plastic, with the soft tip, weighted, lies well in hand, however, as well as the handheld computer. According to the statement of the manufacturer, from the built-in lithium-ionic battery (ТТХ are not listed anywhere) ВЕ300 is capable to work the whole week, really this metric does not exceed 3-4 days at average intensity of usage, till 40 minutes in day. Time of the complete charging of the battery takes about 2 hours. TopMenu - the utility which is drawing up all applications in the vertical list (separate applications are deleted). Supports dynamically formed menus for applications on CF-cards. Backup. The utility of data backup on memory card. Schedule, To Do List, Notes (hand-written and text), Contacts - these 4 applications realize all functions of organizer. Except for the unusual interface all is convenient enough, but also to the latter get used fast. E-mail. The mail box supports several accounts. The client is not so convenient in operation, therefore, if this function is really necessary for you, I advise to look for other program. But besides this is my personal opinion, maybe, ВЕ300's mail program will be pleasant to you. File Manager , appreciably facilitating life at dialogue with ВЕ300 - it is necessary to install it firstly. It will be possible to look for other programs necessary for you in the network, by the way, the part from them is available for free. Since April of 2002 for 29 dollars Casio Company will update operating system on ВЕ300 while it is offered to install Windows CE.NET giving to the user possibility of Pocket Internet Explorer and Windows Media Player. Casio BE300 is rather interesting device, despite lacking of many programs and impossibility of operation with the IR-port. All disadvantages are expiated by price of the device: in USA, on the site of manufacturer, this handheld computer is already selling for 200 dollars, in our country prices change around 240-250 dollars. Taking into account, that the handheld computer on base PPC2002 costs about 600 dollars, it is possible to approve safely: ВЕ300 awaits the big future. In the market there was a situation when various manufacturers release the one-type devices which are practically not distinguished from each other under the price. ВЕ300 is a handheld computer in essence of other class, the pocket manager as it was named by developers. For many, functionality of this device will more than enough, but serious unique disadvantage, the absence of the IR-port, will complicate usage of the mobile Internet through cell phone and will deprive you some other possibilities. As a whole Casio BE300 deserves praise even as the first device of the new class, and exactly the class of budgetary handheld computers on the basis of WinCE - it is really progress. In the given review I did not plan to describe in full details the new PDA from Casio set. Thee is already too much information concerning this product in the Net.